Note: The RAD-900 Radiometer and BBS-200 Blackbody Source instruments are sold as accessories to the I-SITE Camera Testing System. The BBS-200 Blackbody Source is a reference source of infrared radiation similar in geometry to the primary standards of the National Physical Laboratory (UK). The blackbody is designed to emit the maximum possible flux at any given temperature. It is used to make a range of important measurements in the 2-14 μm thermal waveband and is particularly useful for calibrating thermal imagers and radiometers. 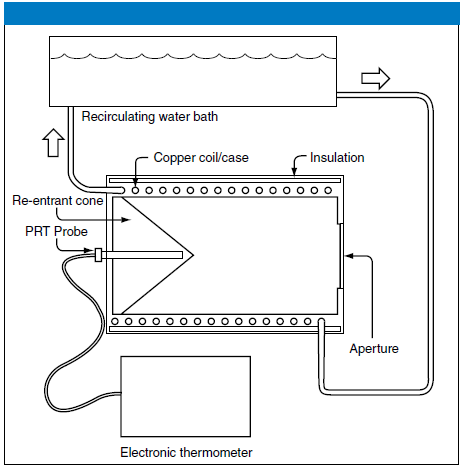 The BBS-200 Blackbody is heated and cooled by a recirculating water bath connected to it with insulated hoses with self-sealing quick-disconnect connectors. In an improvement over similar designs, the BBS-200 features a double-helix water jacket in which water is circulated in the cylindrical heat exchanger from the front to the back and from the back to the front simultaneously so as to minimize thermal gradients along the cavity. Additionally, the BBS-200 features for the first time a separat water jacket for heating and cooling the reentrant cone at the base of the cavity, thereby improving both the uniformity and ramping rate of the source over similar designs. Maintains calibration of the RAD-900 Radiometer. Compatiable with the ACCURad facility in the RAD-900 ScanIRR software. The BBS-200 Blackbody Source consists of a long cylindrical cavity that is closed at one end by a re-entrant cone, and partially closed at the other by an aperture plate.The cavity temperature is monitored by a calibrated precision thermometer. It is controlled by passing water at a carefully controlled temperature through a heat exchanger coil wrapped around the cavity.